GLD (Gold ETF) appears to be starting an upward move toward the neckline of a possible inverted head & shoulder pattern near the 170 level. View the video for more details. A reminder for the email subscribers: if you don't see the video player in your email, simply click on the title of the post "Swing Long On GLD (Gold ETF)" and it will take you to the blog page where you can view the video. Here is a video recapping what the market did for last week and what to watch for the coming week. Here is a look at what AAPL did after earnings. Next up, after the bell on Thursday, AMZN will be reporting its earnings, and here is a look at what could happen. Another blowout quarter from AAPL pushing the price back above $600. Watch for possible fade and the $618 resistance. Watch the video for more commentary. Here is a video on the review for the SP500 and its ETF, SPY. AAPL still have the possibility of moving down to the 568 to fill the gap. Yesterday the short seller covered when it dropped to 571. Watch the video for possible support level. Since the disappointed job report came out a week ago, the market price action took a turn toward the down direction. The market experienced five consecutive down sessions before it did an oversold/dead-cat bounce. Is this new trend a correction or a new downtrend? At the present, most of the talking heads are saying it is a correction. But I'm sure as the market heads down further, many of these talking heads will get more negative and start talking about a new bear market. In regardless whether this downtrend is a correction or a prolong downtrend, one must respect the market's price action. And don't get hung up on what is causing the market to turn downward. Whatever the catalyst is, whether it is: the continuation of the meltdown of the Euro Zone with Spain as the recent trouble spot; the dismal job growth in the US economy; lack of conviction from the Fed to do anymore QE; the strong dollars; or the high crude oil prices; etc. (I'm sure there are more), pay attention to the price action first. It makes no difference to one's account whether he/she know what just caused the market to drop 200 points. What's important is to take appropriate actions to protect one's capital. 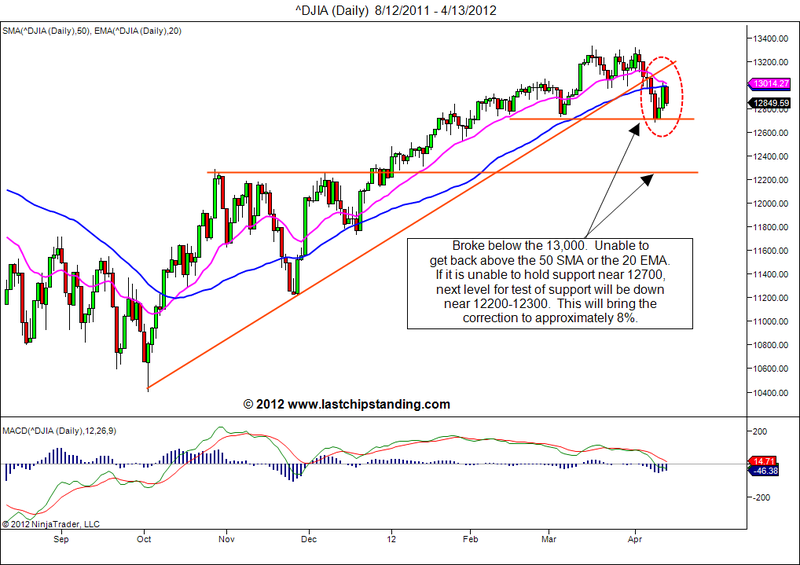 The DJIA gave up the 13,000 level and sitting below the 50 SMA & the 20 EMA. It bounced off the 12,700 on an oversold rally. If it breaks this support level, it can possibly go down to 12,200-12,300, which is equivalent to approximately an 8% correction. 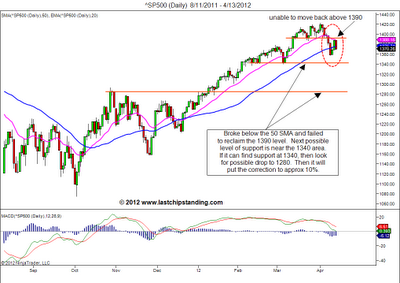 The SP500 has been unable to reclaim the 1390 level. The next possible level of support could be in the 1340 area. If it can't hold this support level, then it could drop to the 1280 for a 10% correction. For the Nasdaq 100, it is trying to hold above the 50 SMA. 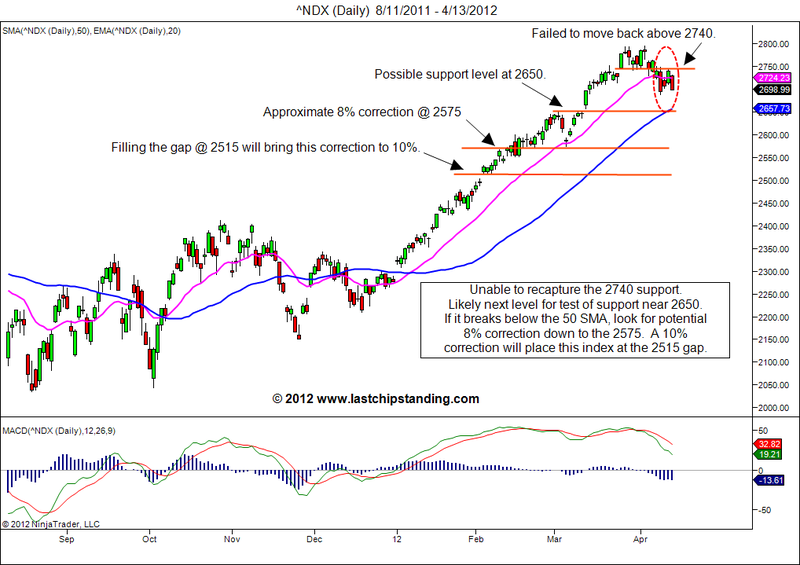 But with AAPL and GOOG rolling over, it is more likely to test the 2650 level for support. Depending on how the tech sector holds up, this index could drop to 2575 or 2515 for an 8% or 10% correction respectively. 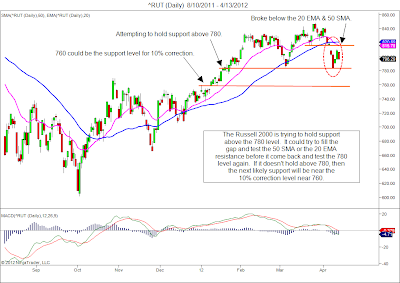 Finally, the Russell 2000 already gave up over 7% from the recent high to the 780 support level. 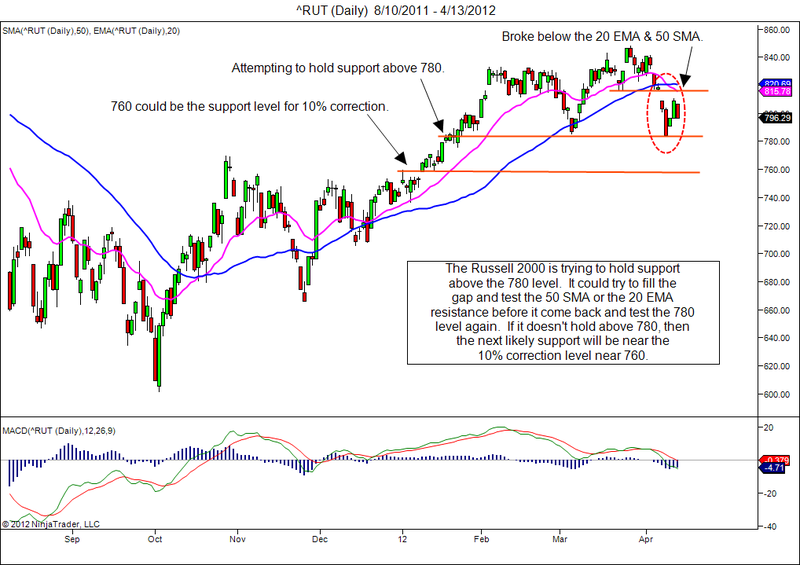 If it can't hold above the 780 level, look for possible downward move to the 10% correction level of 760. As this downtrend still fresh, it is too early to switch from a long to a short position. But it is prudent to tighten up the stops to protect existing profits and minimize the losses. The extend of this slide won't be known until it is completed. The market has a way to surprise all of us. It can quickly reverse and the SP500 make an all time high above the 1575 level. Anything is possible, but might not be probable...but who's to say it won't happen. Stay alert! Here is a brief look at the price actions for CLX that have been moving up with huge volume. The gold ETF, GLD could be forming one of the 4 price patterns. Three of them are bullish and one of them is bearish. Depending on how the prices will break in the coming week, then one can get more clarity on which price pattern it is most likely to form. AAPL is showing signs of weakness while HPQ is breaking out with heavy volume. Here is a video reviewing some of the sectors that have been pushing the market up and how they could drag the market down. The market continue to selloff. SP500 broke through the 1370 support and looks like it is heading down to test the 1340 for support. SPY could be heading down to 134 area. 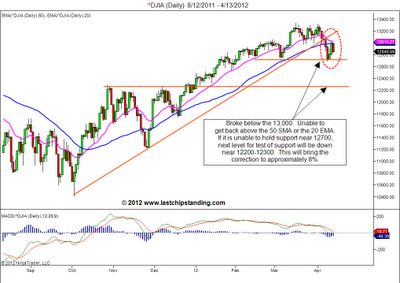 Watch the video to see where the SP500 might find support if it can't hold 1340. Disclosure: no position on SPY. Pay attention to the MACD divergence for AAPL, PCLN, and ORLY. If you are in the trade, be sure to use your stop to protect the profit. A pullback could occur. Pay attention! After a disappointing job report last Friday and with the market being close for Good Friday, Monday's opening can be a rough one. The SP500 overnight future is already showing down near the 1375 level as of this writing. The question is if the SP500 breaks below this support level, where will it go for next support? Likewise for the SPY, if it breaks below 138, where will it find support? Watch the video to find out where the SP500 & SPY might find support. Continue to monitor MCP for more possible upside. It might need to come down and test the 29-30 region for support before it makes its move above 35 and toward 43. Watch the video. The financials could be pulling in the coming week. Check out the video for details. Looks like ZNGA might be making a move to the 14.50 level. Check out the video for details.